July 26, 2016 /0 Comments/in Michigan Birth Injury Attorney /by Reiter & Walsh, P.C. Reiter & Walsh ABC Law Centers is pleased to announce that President and Founder Jesse Reiter was awarded the prestigious Dan Cullan Memorial Award from the American Association of Justice (AAJ) and Executive Board of the AAJ Birth Trauma Litigation Group (BTLG). The award was presented on July 23, 2016 at the Birth Trauma Litigation Group meeting at the annual AAJ convention, hosted this year in Los Angeles. The BTLG is comprised of lawyers who litigate on the behalf of infants and young children who have had brain injuries due to medical malpractice. commitment to excellence in advocacy, as well as for his work for the Birth Trauma Litigation Group and the children it serves. The award is bestowed on those who exemplify the qualities of Dr. Dan Cullan, an MD and JD who dedicated his career to advocating for children impacted by birth injuries. Cullan was a renowned physician and trial lawyer; he co-founded the American Association of Justice’s Birth Trauma Litigation Group, was a member of the Inner Circle of Advocates, was President of the American College of Legal Medicine, and served as a professor of Preventive Medicine at Creighton University School of Medicine. 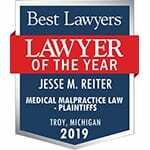 Attorney Jesse Reiter has been practicing law since 1987; he devoted his career to helping children with birth injuries. His firm, Reiter & Walsh ABC Law Centers, is one of the few law firms in the nation that focus only on birth injury and birth trauma. 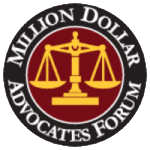 The Oakland County resident sits on the Board of Governors of the American Association for Justice, and is an Executive Board Member of the Michigan Association for Justice. He is also a former Executive Board Member and Chair of the Birth Trauma Litigation Group. 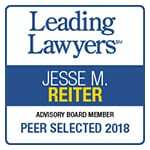 Reiter has been consistently selected as one of the Best Lawyers in America by U.S. News and World Report, and is listed as one of the Top 100 Trial Lawyers by the National Trial Lawyers Association. He has also won the Michigan Defense Trial Counsel’s Respected Advocate Award. Reiter earned his juris doctor from Chicago’s DePaul University College of Law. He also holds a Bachelor’s Degree in Political Science from the University of Michigan in Ann Arbor, MI. Jesse Reiter of Reiter & Walsh, P.C. Sponsors the University of Michigan’s... Reiter & Walsh ABC Law Centers Welcomes Euel Kinsey to the Team!